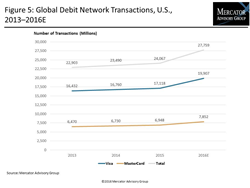 Mercator Advisory Group analyzes U.S. debit market trends, transaction routing changes, transaction volumes, and total value by routing method. Data regarding debit cards is not as publicly available as it once was. Given the market shifts, this information is as important as ever to issuers, networks, and processors, who need to react to the ways that debit card transactions are being routed.